With all this coastline, who wouldn’t want to go fishing on Tasmania’s east coast? Pack your gear (or hire some), seek out a beach, jetty, river or estuary and try your luck. You’ll find boat ramps and gear hire in most coastal towns, and the inland streams offer tranquil locations to test your skills against local river trout. 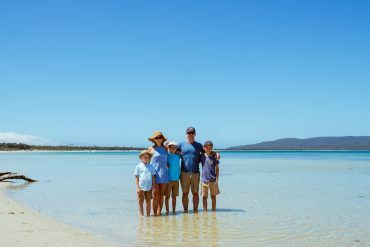 All along the Great Eastern Drive, from Orford to St Helens and the Bay of Fires, you’ll find opportunities to throw in a line and try for local catches of Australian salmon, flathead, bream, even shark and skate. More adventurous fisher folk can also try for a catch of abalone or southern rock lobster (licences required) or join a deep sea or game fishing charter. St Helens is a prime place to join a professional fishing charter and give offshore and big game fishing a try. Local operators include Rocky Carosi’s Game Fish and Michael Haley’s Gone Fishing. Charters are also available on the Freycinet Peninsula—try Coles Bay Hire and Hooked at Freycinet in Coles Bay. You can try for a river trout in the inland streams and rivers on the east coast, including the Georges River, which flows from the mountains west of St Helens to Georges Bay on the coast. Inland fishing licences and information are available through the Inland Fisheries Service. Apart from the east coast’s two marine reserves at Maria Island and Governor Island, you can try for a bite almost anywhere between Orford and St Helens. As you meander along the highway and explore coastal towns, keep watch for a place to stop and spend a some time catching your dinner. Marine reserves have been established for the protection of habitat and marine life along the western side of Maria Island and at Governor Island, near Bicheno. Fishing is not permitted in these areas. Licences are not required for rod and line saltwater or marine fishing in Tasmania, however recreational sea fishing licences are required for some species, including rock lobster and abalone. Check the Department of Primary Industries, Parks Water and Environment website for current information on licence requirements. You can also pick up your free copy of the Recreational Sea Fishing Guide From Visitor Information Centres and fishing shops along the coast, or download the Sea Fish Guide phone app. Professional fishing charters offer half or full day trips ranging from relaxing reef fishing to the excitement of deep sea game fishing. Or you can just throw in a line at your leisure and spend as long or as little time as you like, fishing from jetties, beaches and rivers along the coast.